Scenic Drive Perth | Are You Selling? Scenic driving on the West coast of Australia often has a lot to do with beaches, sand, ocean, and beaches. And for good reason! We figured that Perth drivers are probably into that, so we made sure to start this tour out with a little sunny seaside wandering before trying out some spots inland, and we don’t mean the desert this time. (That said, if you are interested in the desert, check out the last post here). So if you’re selling a car in Perth and interested in some new spots to check out with your next vehicle, this drive has an eclectic taste and is even good for kids if you got ‘em. The first leg is about 35 Kilometres and will take roughly half an hour if you don’t get tempted to stop along the way. Leaving from the CBD, take State Route 2, the Mitchel Freeway, until you see Marmion Avenue where you’ll exit. Follow signs for Rothesay Heights towards the Rise. If you’re hanging out for a coffee and a morning stretch of the legs, make your first stop at Scarborough Beach. Famous for sparkling white sands and warm water, you can also\ try your hand at surfing, wake boarding, or even fishing. Roughly 1.4 kilometres north lies Trigg beach, home of rock pools and small islands. Take the walk there or head south to the nudey Brighton Beach and free yourself of those constricting fabrics we call clothing. The locals advise swimming in the morning in Scarborough due to the state of the wind and the ocean so it’s a good place for your first stop. Pastel colours of the famous Scarborough Beach, WA. Now you can either hop back on the highway or opt for the West Coast Scenic Drive. Seeing as you’re on a scenic drive, you’ll know which one to pick. This road will take you along the quiet and protected bays up the coast to Hillary’s Harbour. There are many beautiful places to stop and enjoy the salty breeze along the way. 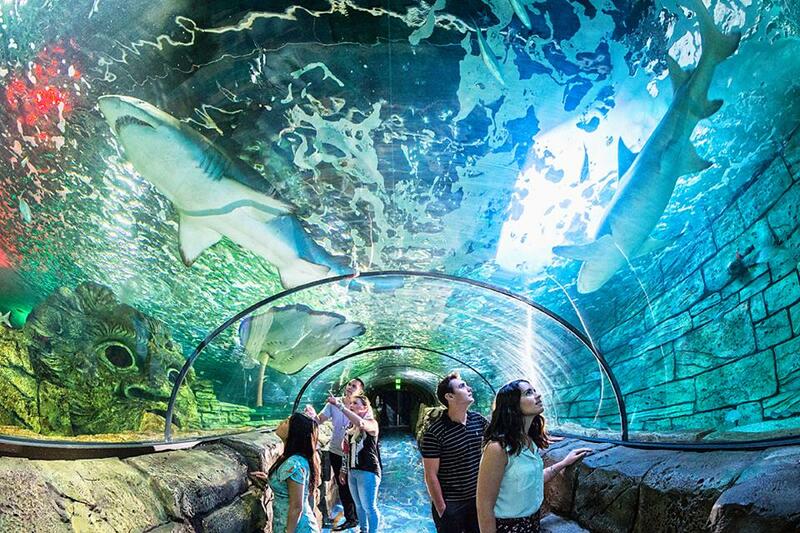 If you’re looking for another perspective on sea life, head to the Aquarium of Western Australia. They have one of the largest indoor aquariums in the world with their very own natural coral reef, myriad sea creatures, and even sharks. If you’ve got a concession card bring it along. Entering the dream like state of the Aquarium of Western Australia in Hillary’s Harbour. 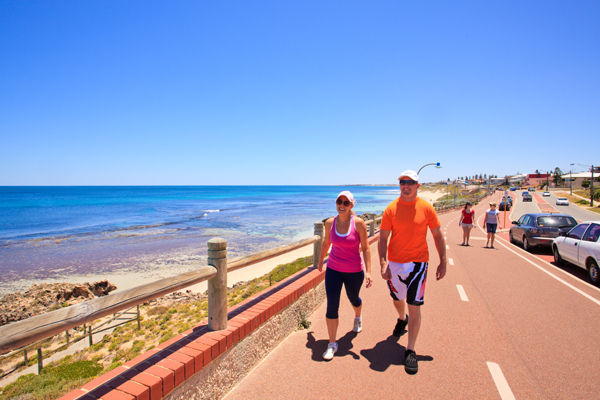 Back on the road going North, follow signs to Mindarie Marina or Mullaloo Beach. By now you’ll be ready for a lunch stop, and this is the place to do it. Sit amongst the European style café culture and enjoy the fine, worldly cuisine with many a tourist and local alike. Afterwards, take a leisurely stroll along the sunny boardwalks and imagine you are off the coast somewhere in Italy. Getting the blood moving along the sunny Mindarie Marina. Forging right ahead, hopefully with a full belly by now, we’re turning things inward. We don’t really mean introspectively but feel free take have some quiet driving time for the next 32 kilometres along Aqua Road which begins at the town of Yanchep. The drive itself is slightly twisting and winding with glimpses of the landscape to come. The Gnangara-Moore River State Forest is where you’re heading and it shares it’s borders with Yanchep National Park as well as the Yeal Nature Reserve. Amongst the 71,000 sprawling hectares you can indulge in bird watching, horse riding, and exploring the 4WD tracks if you’ve got the vehicle for it. Along with the native fauna, there have been reports of feral goats and European rabbits that have made their way into the park. You’ll find several trail heads with tracks suitable for all ages but, due to the feral animals roaming about, best to leave your dogs at home. 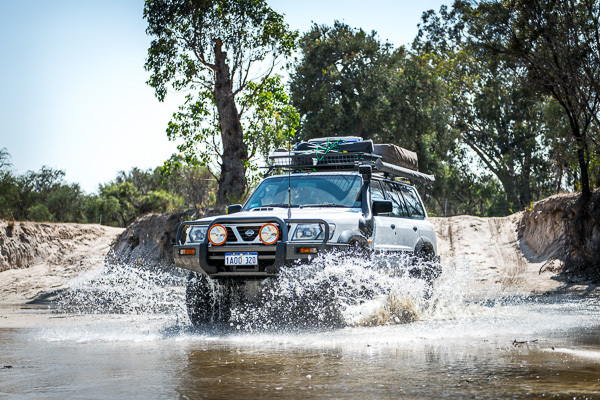 Off roading in Gnangara-Moore River State Forest, crossing the Moore River. Since you arrived in the park from Aqua Road, you’ll likely be exploring in the Southern end of the grounds. If you head straight through the centre point north, it will take about 45 minutes until you emerge at the top end. This is a good way to enjoy a scenic viewing from the comfort of your own car. As you reach the North end, you will find yourself at the Gravity Discovery Centre. That’s right, not just your average day at the beach after all! You’re about to discover an interactive science centre and observatory, and it isn’t just for kids. 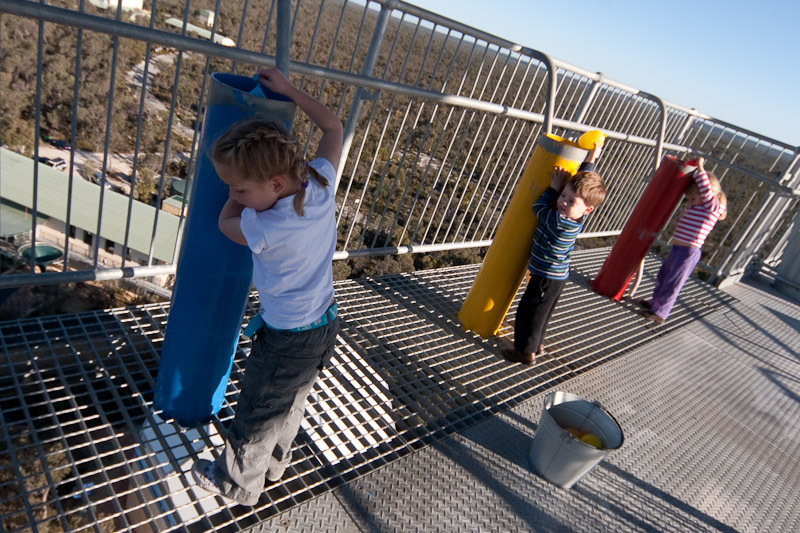 You can learn all things space here and even drop water balloons off the observation tower, in the name of science of course. Word on the street is that these scientists also host a lovely little café that makes a good cup of coffee or tea to give you that little boost for the drive home. Dropping balloons in to the “zone of destruction” at the Gravity Discovery Centre. As the sky is turning rather pink and dreamy, you can make your way back down towards the coast from whence you came. If you’re like us, you’ll find something satisfactory in making a full loop, so you can take National Route 1 to Highway 95, to State route 52, 51, and finally you’re home. All up, the return drive is an hour and thirty minutes and you’re back in time for supper.